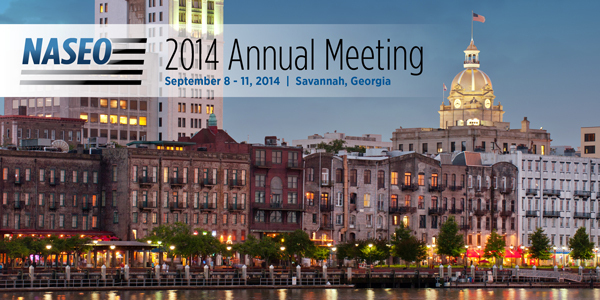 On September 8-11, 2014, state and territory energy officials from across the country came together in Savannah, Georgia for the 2014 NASEO Annual Meeting. Over 250 attendees participated in four-day event, which included several pre-conference sessions with the U.S. Department of Energy, presentations on EPA’s 111(d) draft power plant rule and other emerging issues, and a workshop on multifamily energy efficiency opportunities. All presentations made during the conference are now available. Of particular note was a presentation by former Assistant Secretary for Policy at the U.S. Department of Energy, Dr. Susan Tierney. Ms. Tierney is a longtime friend of the State Energy Offices and serves as a Senior Advisor with Analysis Group. She provided a keynote address focusing on the U.S. “energy evolution” including efficiency, diversification of the energy supply, economic development, improvements in environmental and air quality and the “flattening” of the nation’s reliance on fossil fuels. Dr. Tierney encouraged states to take advantage of the efficiency and renewable energy opportunities that may result from EPA’s Clean Power Plan under 111(d), and to develop innovative paths to compliance that will ultimately help the nation tackle energy challenges. Another highlight of the conference was the keynote presentation provided by Dennis McGinn, Assistant Secretary of the Navy for Energy, Installations, and Environment. Assistant Secretary (former Vice Admiral) McGinn discussed efforts the U.S. Navy has taken to increase energy efficiency and overall stewardship of resources. He presented a range of Navy energy efforts including energy efficiency retrofits, advancement of biofuels for marine and aviation, and other sustainability and resilience actions. He stressed the importance of partnerships with the states to achieve the military’s goals of improved energy efficiency and greater reliance on renewable fuels. • A breakout session on EPA’s draft 111(d) rule including energy efficiency and renewable energy compliance options as well as “non-ratepayer” options, which comprise more than 50 percent of all energy efficiency investments annually. • An in-depth session on evolving utility business models in the ever-changing electricity markets brought on by increasing levels of distributed generation, energy efficiency, demand response, storage and micro-grids and discussions about how costs are applied across the consumer-base and how this evolution has served as a catalyst to look at new business models. • A presentation on the paradigm shift in the potential use of micro-grids by states and local governments, and the related opportunity presented by the U.S. Department of Defense’s Electric Vehicle to Grid Program. • An overview of several states comprehensive State Energy Planning lessons learned and best practices and an update on NASEO state energy planning resources. • A look at how private companies and State Energy Offices are leveraging zero net energy ready buildings as a way to meet economic, resilience, and energy goals. The meeting ended with a special presentation by former U.S. Senator Jeff Bingaman who announced the release of The State Clean Energy Cookbook: A Dozen Recipes for State Action on Energy Efficiency and Renewable Energy. Senator Bingaman discussed the development of the bipartisan report which was a joint effort with former Secretary of State and Treasury George Schultz and was the result of a study by Stanford University’s Steyer-Taylor Center for Energy Policy and Finance and the Hoover Institution’s Shultz-Stephenson Task Force on Energy Policy. Senator Bingaman highlighted the fact that the bipartisan group recommended only one federal action — expanded support for the U.S. State Energy Program and emphasized the key role states play in advancing energy efficiency and renewable energy. For more information, please visit http://annualmeeting.naseo.org/.